One of the best, most professional synths on iPad, Wavegenerator will knock the socks off PPG fans and newcomers alike. Legendary PPG sound. Images can be converted into waves. Arptor can lock to incoming MIDI. Modulation galore! Doesn't cut corners. Doesn't work with virtual MIDI. Complexity can be intimidating. In the 80s, the PPG Wave series represented a groundbreaking advance in synthesis technology. PPG mainman Wolfgang Palm essentially built the template for every sample-based synth that followed. "PPG Wavegenerator attempts to evolve the PPG synth technology into something new, while retaining the character of the original instrument"
Unlike many imitators, Wavegenerator doesn't dilute the formula for easy tweaking; instead, Palm has presented a deep, complex and fully featured synthesiser for iPad - it's something that may come as a bit of a shock to the novice synthesist, with a level of complexity that would be impressive even in desktop plug-in format. The original PPG Wave synths generated sound by scanning digitally stored waveforms. These waveforms were strung one after another in a 'wavetable', and modulation sources like envelopes, velocity or an LFO were used to move the 'playhead' within that wavetable. This enabled everything from slow, evolving tones to violent timbral shifts. The sound was undeniably digital and full of grit, grunge and aliasing. It was, in a word, awesome. Wavegenerator maintains this approach, but adds the ability to create your own waves and wavetables - something only available to Wave owners if they stumped up another ten grand for a Waveterm computer. Palm has taken that particular technology further here, with the ability to convert photos into waveforms. This is accomplished using existing pics or new ones via the iPad's camera. The process couldn't be easier and results are invariably interesting. You even get a 3D view of the resultant spectrum. Oddly, this is the only resynthesis on offer - you can't sample or transform incoming audio. 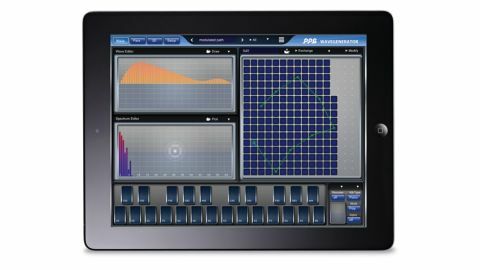 "Wavegenerator represents a big step forward for iPad instruments. This is your chance to dive in at the deep end"
Wavegenerator's functions are divided into four pages. The Image Transformer and graphical spectrum display live on the 3D page. The Para page offers the typical synthesis parameters, including access to Wavegenerator's three oscillators, triple noise generators, filter and modulation sources - and boy, does it have a lot of mod sources! No less than 13 loopable envelopes are on offer, as well as four LFOs. Plus, the oscillators themselves can be switched into Sub mode, making them available as mod sources, too. Then there's the Arptor, which is a cross between an arpeggiator and a step sequencer, clocked internally or via MIDI. The oscillators take their grist from the Wavetable, which is edited on the Wave page. Here you can draw in and manipulate individual harmonics using additive synthesis, or by drawing directly into the Wave Editor - far easier than entering partial amplitudes numerically with the Waveterm's keys! You can have up to 256 waves per wavetable, and the path of travel through them can be laid out manually and modulated. Advanced stuff made easy. Wavegenerator represents a big step forward for iPad instruments. If you liked Animoog but thought it too basic, this is your chance to dive in at the deep end. And if you love the PPG sound, you're going to be in heaven. It's not without its problems - we couldn't for the life of us get it to work with any iPad sequencers via virtual MIDI - but it's a magnificent first leap into iOS for PPG, and a must for any serious electronic musician.